Paypal Adaptive Payments is feature of Paypal Pro means you must have Paypal pro account for use this payment method. In this customer can pay with Credit Card/Debit Card/Paypal.com account. While paying with Credit card/Debit card he can also create a account in paypal.com. 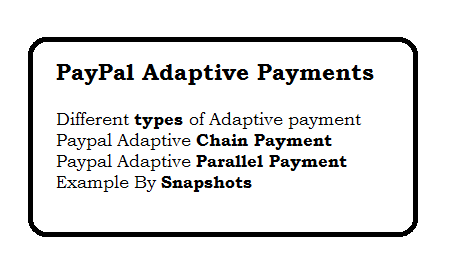 Adaptive payments handles payments between a sender and one or more receivers. In this method, customer will pay to two or more vendor at the time. Also customer will be aware of the vendors with what amount they are getting. For Example: Customer buy one product and pay $10 to each vendor, He will see two vendor name in Paypal.com as well as two orders in payment history. In this payment, Customer will see only one vendor name (Primary), He will be totally unaware of other beneficiary. In this case, First all amount will be transfer to primary vendor. then from the primary vendor amount will be deducted and transferred to other beneficiary. For Example: In Primary Vendor Payment history there will be n+1 records where n is number of vendor except self. It means if there is total 3 vendor (1 Primary + 2 Secondary), He will get 3 order (1. full payment, 2. Second vendor transfer money, 3. third vendor transfer money). You can set only one primary vendor who will get the money directly from customer other will be secondary get the money from primary vendor and primary vendor can't stop to giving money. Vendor don't have paypal Account: If vendor don't have paypal account. Paypal will send an email to vendor, then vendor can register with that email and get his payment.